Carl was cruelly, painfully, and wrongfully terminated from the church he served as pastor – a political move by miss-informed elders who manipulated others for selfish reasons. Carl and JoLynn were bruised and beat-up but the wounds were not fatal nor did they result in permanent damage. When I met them in 1991 I recognized and related to the pain but was also impressed with their hope for what God was preparing them to do in the future. They were totally depending on God. They were invited to join the same ministry I was working with – but that turned out to be a detour which ended in a road block. Next, Carl and JoLynn thought God was calling them as missionaries and began raising funds but after two years the hoped for support totaled less than $200 per month in pledges. Another detour and road block. More time to practice intentional dependence. There were more detours, more unexpected turns, including a return to school for Carl to earn a doctorate in counseling. The test of patience was excruciating, but slowly God cracked open doors and cautiously Carl and JoLynn stepped through. It was a time of intensely and intently depending on God as they found themselves with pastors and missionaries in Eastern Europe and Ukraine. 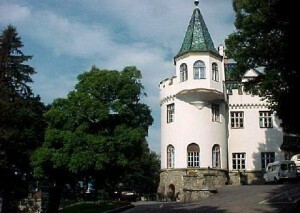 About ten years ago, God directed them to Austria where Carl and JoLynn began to host retreats for missionaries and pastors. They found themselves trusting God in every way as those retreats g ave birth to intensive, one-on-one counseling with ministry couples; often for two weeks at a time. God is using Carl and JoLynn to touch the lives of scores of people in ministry. For Carl & JoLynn, intentionally depending on God has not gotten any easier; it’s still a daily exercise of self-discipline. No one has written a multi-million dollar check. Every time a couple shows up; every time they travel to another location for ministry; every day is a new reminder of how utterly dependent they are. I’ve known Carl and JoLynn for 24 years and we just spent a few days together at a conference in Wisconsin. As we talked and shared I was reminded that life has not turned out the way they had planned but God has revealed His plan and provided in miraculous ways to accomplish some amazing things. It all comes back to their decision to depend on God. What about you? What tough turns has life brought your way? Do you find yourself on a detour that has you confused? Have you run into a road block? Wherever you are, in whatever situation you find yourself, I challenge you to be intentionally dependent on God. 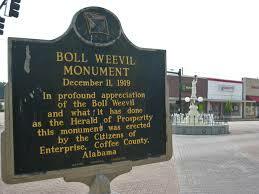 In southern Alabama there is a town called Enterprise, where one can find a monument to an insect: the Mexican boll weevil. 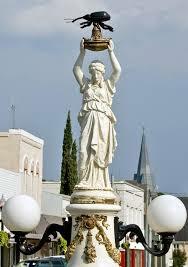 In 1895 the boll weevil destroyed field after field of cotton, the major cash crop of the county. Desperate to survive the farmers l ooked for something that would grow in the soil and climate; they knew they had to diversity or die. Soon they were planting peanuts and by 1919 the county’s peanut harvest was 10 times greater than best cotton crop on record. That year a fountain and monument were built and the inscription reads: “In profound appreciation of the boll weevil and what it has done as the herald of prosperity this monument was erected by the citizens of Enterprise, Coffee County, Alabama.” Out of a time of struggle and crisis had come new growth and success. That’s a difficult lesson – one we work hard to avoid. We want to escape trouble and hard times. We often pray for God to rescue us from problems and make everything nice and easy. We want to be comfortable! Please don’t miss-read this! I’m not suggesting we start building monuments to a divorce, bankruptcy, or cancer diagnosis. But maybe we should consider the possibility that God is leading through those trials to a greater purpose. Evil, enemies, hardship, pain, grief, foolishness – all have a purpose. They expose the deception of Satan. The truth is all evil has already been defeated. All enemies have already been scattered. All folly has already been exposed! Instead, our strength is in the Lord who gives us the spiritual eyesight to see what Joseph saw. God is exalted forever. In light of that truth and principle, all else fails to have importance.